Like many others, I’ve been riveted by the Real Estate Tax Collectors’ strike and sit-in. How did these civil servants manage to launch such bold and sustained collective action over a period of months? And if indeed their grievances have been festering since 1974, why was it only now that they took action? Most puzzling of all is how they managed to garner sympathetic media coverage and drum up public support. After all, the Egyptian civil servant is not exactly a beloved figure. Who hasn’t had a bad experience with some obstructionist, misanthropic muwazzaf? (Yes, I’ve been stung a few times). The tax collector especially is richly reviled, perceived as a thief in official garb, extracting revenues for a state that has long ceased to provide protection and services. How is it that tax collectors all of a sudden became sympathetic figures with a just cause? With all of these questions and more, I went in search of an unusual tax collector, a lifelong political activist, and a very endearing man with a wicked sense of humor: the remarkable Kamal Abu Eita. First I wanted to know how Abu Eita became a real estate tax collector, so we started at the beginning. Kamal Muhammad al-Rifa’i Abu Eita was born on March 1, 1953, one of eight children of a minaret-maker in Bulaq al-Dakrur who went on to establish a contracting business. Kamal enrolled at Cairo University in fall 1972, and like generations of Egyptians before and after him, received a first-rate political education at this storied institution. He became active in campus politics and was a founding member of the Nasserist Thought Club (Nadi al-Fikr al-Nasiri), the student initiative that midwifed the contemporary Nasserist movement. 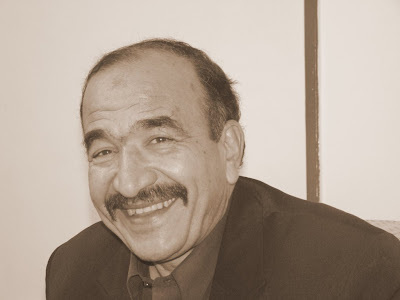 After college, Abu Eita joined the Tagammu’ party until the formation of the Nasserist party in 1992, which he joined but then left for the neo-Nasserist Karama movement in 1999. Throughout his political career, Abu Eita combined partisan commitment with para-partisan advocacy on behalf of a wide range of causes, from peasants to prisoners of conscience to public sector workers. For his efforts, he has been imprisoned a whopping 19 times. “I’ve been a guest at all of Bulaq’s police stations and nearly all of the country’s prisons!” he chuckles. Especially significant for the December sit-in is Abu Eita’s capacity to enrich his organising with his politics while at the same time not imposing his politics on his fellow tax collectors. Abu Eita’s unlikely career as a civil servant began immediately after college. Right after graduating in 1976 with a B.A. in philosophy, he applied for a teaching position with the Ministry of Education but was turned down for security reasons. He spent six months as a clerk in the Giza governorate and was then transferred to the Giza Traffic administration, but the office responsible for the security of the Israeli embassy was located there and Abu Eita was deemed a threat (! ), so he was transferred back to the Giza governorate and stayed there until 1979, when a friend casually let him know that the Real Estate Tax Authority was hiring with decent salaries. So Abu Eita applied and became a tax official. So how does one organize government clerks to coordinate a strike and sit-in, and why now? As usual with such collective action, there are important but forgotten precedents and equally important but also forgotten triggers. Abu Eita reminds that the precedent was set in March 1999, when property tax collectors gathered in Tahrir Square to demand benefit raises, then staged a sit-in in front of parliament and the office of the Minister of Finance. Their demands were met, though less than 10% of tax collectors participated in the sit-in. “The government agreed to our demands in 1999 because the economic reform and privatization programs were not as far along and the state’s fiscal crisis wasn’t as severe,” Abu Eita explains, arguing that today the government is more strapped than ever, rendering ministers extremely reluctant to concede to wage increases of the sort tax collectors are demanding. If tax collectors had the 1999 precedent to go on, they were also prodded to action by a more proximate trigger. In 2005 as is well known, the government issued a new law attaching sanitation fees to the electricity bill and entrusting the Electricity Authority to collect the fees. What is less well known is that before the new law, property tax collectors were the ones tasked with collecting sanitation fees, earning a minuscule commission that was nevertheless important given their hardscrabble lives. Added to the persistent corruption and mismanagement of the municipal governments that supervise tax collectors, the new sanitation law was the last straw that galvanised the civil servants to action. “On 21 October, we headed to the Ministry of Finance in Nasr City and called out to the Minister, “Come down from your ivory tower!” but of course he didn’t because he was busy in America. We then walked in a huge procession to the Cabinet building, but security prevented us from entering to negotiate. 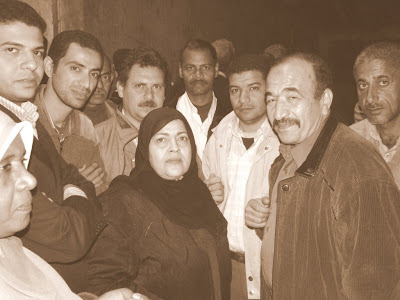 On 13 and 14 November, we held our sit-in at the Egyptian Trade Union Federation on Gala’ Street; they locked all the bathrooms and meeting rooms, leaving us only the pavement of the entrance. Then and there we decided to hold another sit-in but didn’t publicise the location until the last minute, and that was the Hussein Higazy sit-in that started on 3 December.” It was at that final sit-in where Abu Eita could be seen carried aloft on the shoulders of his colleagues, innovating catchy, eloquent slogans and waving the keys to the offices and file cabinets that he and his colleagues had abandoned in their walkout. There was something about the December sit-in that captured the public imagination in a way that surpassed even the massive Mahalla strikes of December 2006 and September 2007. The reasons for this are complex and will not be fully apparent until some time has passed and we gain some distance to analyse, but there’s no doubt that the tax officials’ collective leadership and deft tactics succeeded in making the lowly tax collector a stand-in for the hardworking, downtrodden everyman and woman, ravaged by high prices and hovering on the brink of poverty. Significantly, the civil servants courted both regime figures and anonymous members of the public. Their slogans were careful to appeal to the president and invoke his sense of fairness and to praise the Interior Minister for the discipline of his forces. Their conduct of the sit-in respected the residents of Hussein Higazy Street and sought to minimise disruption to their lives (no bullhorns or slogans after 10 pm, for instance). The residents were won over. Abu Eita recalls the details of their supportive acts. “They made their bathrooms available to the women and children in the sit-in; they removed the rugs from their living rooms and threw them down to us to cushion the freezing pavement; one resident sent his wife and children to his in-laws and offered up his apartment for the protestors to sleep in.” Opposition papers reported that street residents also refused to file complaints against the sit-in with the city government. After 11 days of the sit-in, Finance Minister Youssef Boutros-Ghali, acting on orders from Hosni Mubarak, informed the collectors that their core demands for affiliation with the Ministry and wage parity with general tax collectors would be fulfilled; that they would receive bonuses equivalent to four months’ pay; and that no tax collector would be punished for participating in the sit-in. This agreement was finalised yesterday, the last day of the year. So concludes this remarkable episode of the last quarter of 2007, the first time since 1924 that civil servants staged a work stoppage to ameliorate their conditions. As we usher in 2008, I can’t help wondering what comes next in Egypt’s extraordinary cycle of protest.